In an interview, Sued Castro Lima, a retired Brazilian Air Force Colonel, evaluated potential scenarios that could create conflicts among the ranks of the military. Tensions among senior officers of the Brazilian Armed Forces have made headlines recently, generating controversy over the positions and the role of the military in the current political landscape. Sued Castro Lima is a retired Brazilian Air Force Colonel and served as a former pilot, who accumulated more than 5,000 flight hours during his time in active duty. In 1998 he withdrew from the Air Force and later joined the Nucleus of Strategic Studies at the Federal Flumiense University. In an interview with Brasil de Fato, the colonel addressed a range of topics related to the Brazilian Armed Forces including it’s historical role in governance. "It is not unreasonable to say that the political ideology of the Brazilian Military, with occasional exceptions, is rooted in the 1960s," Colonel Sued state. Brasil de Fato: In recent weeks, reports have surfaced about joint U.S.-Brazilian military operations in the Amazon. Is this unusual from a historical perspective? Do you think this poses any risk to our sovereignty or our national security interests? Colonel Sued Lima: Several joint military trainings have been carried out over the last few years. Take for example, the historic UNITAS military program, which involved joint U.S-Brazilian naval exercises. This is precisely why the three main branches of the Brazilian Armed Forces have been transferring their operational bases from other regions of the country to the Amazon. Personally, I find it very difficult to understand this ambiguous contradiction. On the one hand, the Brazilian military is increasing it’s presence in the region. Yet, the Amazonian territory is being opened up a very threatening military force. Earlier this year, foreign minister José Serra secretly tried to restart Fernando Henrique Cardoso’s negotiations, which seeks to sell the entire launch base to the US government. However, the discussions have received very little attention by the mainstream media. What are the potential security and political implications of forfeiting control of the Alcantara base to the hands of foreigners? It depends on the partner. Ukraine, a partner until recently, had important knowledge of aerospace technology and initially was willing to transfer part of that knowledge to us. For more than twenty years that country has been able to launch satellites using its own launch vehicle. However, when the United States government entered into negotiations under the government of Fernando Henrique Cardoso, it imposed a list of requirements that would have effectively transformed our national launch station into something resembling the Guantánamo detention facility. However, there demands should not come as a surprise since it is entirely consistent with the U.S.’s international position, which opposes any country's access to rocket launching knowledge and capability. In their negotiations with former president Cardoso the U.S. government was unwilling and refused to provide any level of technology transfer in the space area exploration. The U.S. political posture was further revealed by Wikileaks in 2011, which showed that the US government actively tried to prevent the development of a Brazilian space rocket program. The wikileaks cables also revealed that the U.S government explicitly pressured Ukraine not to support our space launch program. They considered it undesirable that the Ukraine assist us in the the transference of technology. So, it’s regrettable to see the current Brazilian authorities re-entering negotiations that would give up the Alcântara Base to such an abominable partner. According to recent news reports, the negotiations are in the final stage, which is absolutely deplorable! The privatization of the first Brazilian satellite and the Aeronautics communications network – along with civil airports- seems to be the order of the day. What could possibly justify such measures? What does the country lose with the possible privatization of these services and equipment? I do not know of any world power which allows it’s military communications network to be operated by private companies. First of all, it is worth noting that highly sophisticated technological infrastructure is needed in order to facilitate government communication systems. Secondly, this requires a high level of capital investment towards the production of equipment such as satellites, launch vehicles and other infrastructure items. As I stated, I cannot think of a state company that would be capable of assuming such a technically sophisticated and expensive task. That said, surrendering these projects to foreigners would essentially result in the end of our national sovereignty. It is difficult to build an autonomous Aeronautics communications system because the necessary technologies are limited to a select group of technologically advanced groups. If you look at these technologically advanced nations none of them have never assigned such a responsibility to the hands of private companies. In the case of Brazilian privatizations, in the broadest sense, we are experiencing a setback. The state has invested knowledge and capital in the assembly of large infrastructure projects as well as state-run companies. At the beginning, the state is forced to endure financial losses from the initial operational costs. However, once the company or infrastructure project becomes profitable it is later sold to a private corporation at a cost lower than was initially invested. For example, in the case of Eletrobras, there is information indicating that the current government intends to sell the company for a value 13 times lower than the real capital that was initially invested in it. According to Ildo Sauer, a former director of Eletrobras, even the PT's government has expressed intentions to sell one of the largest electricity companies on the planet. The so-called efficiency of private companies can be evaluated by the example of the privatization of Companhia Vale do Rio Doce and it’s eventual sale to Samarco Mineração SA, which was responsible for one of the greatest environmental disasters experienced by mankind. So, from my perspective, the restoration of democratic governance must include the reversal of these recent privatization measures. The Brazilian nuclear submarine program also faces a number of challenges at the moment. How important was it to the Armed Forces and to the country? The construction of a submarine with a nuclear propulsion system was first identified as a strategic priority by the National Defense Strategy of 2008. The Navy considered the equipment essential for the defense of the Brazilian coast, with particular emphasis on protecting the off-shore oil fields. It is a bold project, which requires a high level of technological complexity and capital investment. The total investment is estimated to cost around $32 billion and more than half of that money has already been spent. However, the operational upsides are incomparable. The current estimated date for completion is projected for 2027. However, this represents six-year delay compared to the original estimated completion date. The country's recent economic woes has certainly contributed to the delays. Due to a lack of fiscal resources the project has been unable to move forward. Another major obstacle in the submarines completion was the removal of the lead scientist involved in its project, Admiral Othon Silva, who was sentenced to 43 years in prison for his involvement in the Lavo Jato corruption scandal. However, in my opinion, it is is not out of the question to assume that that there was something nefarious behind Admiral Othon’s arrest and subsequent sentence. I am not ruling out the possibility that his prosecution could be part of a larger strategy devised by powerful foreign governments that seek to undermine Brazil’s ability in defending ourselves against any potential military intervention. That said, I feel that is necessary to move forward with the plan that was initially laid out and for the resumption of the project. This submarine is of strategic importance in deterring against any potential outside intervention. Even the purchase of new fighter jets for the Brazilian Air Force have been the subject of investigations and criticism. What is the need to strengthen national military aviation? For the same reasons that justify the construction of the nuclear submarine. It is not feasible to overcome a stronger military threat. However, it necessary to strengthen out dissuasive capacity, which is defined as the ability of a country to promote significant damage to the forces that attack it militarily, forcing potential invaders to to think twice before engaging in military combat. Take for example Argentina, which was defeated by Britain in 1982 during the Falklands War. However, Argentina’s Air Force inflicted extensive damage to British forces, destroying 35 aircrafts, 9 military ships and killing 260 British military officers. However, in the end, Argentina’s deterrent strategy was incapable of preventing the colonialist drive of the British colonial empire. Brazil, because of its geopolitical position, should strengthen it’s deterrent capacity, which is effectively irrelevant. North Korea and Iran have opted for nuclear weapons as a defense. It is not an accident that the US has refrained from invading these two countries. The pentagon considers military action against North Korea and Iran as unwise and or too risky. This was not the case with countries such as Iraq, Afghanistan, Libya and Syria, among others. I am going to shift gears and ask a slightly unrelated question. 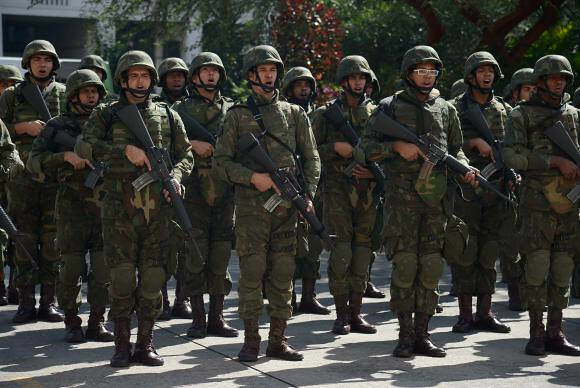 In the context of Brazil’s public security crisis, the Armed Forces are being deployed in various Brazilian cities. What are your thoughts on this? I think this is a demoralizing measure. The security crisis in Brazil requires two types of action: social measures along with policing. One does not work without the other. However, it is inappropriate for the Armed Forces to take on this particular task. Similarly, in a recent article published journalist Jânio de Freitas's, he reflects on his experience while attending the United Nations Conference on the Environment in Rio de Janeiro in 1992. In his article, he remembers military police were deployed throughout the city, with military tanks aiming cannons at residents living in the favelas. In fact, the former U.S. President Bill Clinton, who was attending the event, referred to the excessive military presence as ridiculous. So, the latest military operations suggest that there has been little change in the quality and effectiveness of such military interventions. In situations like this, the military spends a few days garnering full attention from the media. After several days of extensive media coverage, the Defense Minister will proclaim some kind of victory. At which point the soldiers will be withdrawn and everything will return to the way things were. The government and parliament are discussing the a measure that will grant foreigners easier access to purchase land in Brazil. Do you think this imposes any threat to the country’s national sovereignty? I do not think I am sufficiently informed to discuss this matter. I know only that there is interest in the Temer government in passing legislation that would facilitate the sale of land to foreigners. Behind the talks are Minister Eliseu Padilha and Federal Deputy Newton Cardoso Júnior of the PMDB-MG, which raises many red flags and suggesting that the legislative proposal would potentially undermine our national interests. Has there been a shift in Brazilian foreign policy? Does it impact the performance of the Defense? In what way? More than just military equipment, national defense strategies of any country is directly related to its position on foreign policy. I think it is worth praising the leadership of former foreign minister Celso Amorim, who in my opinion demonstrated remarkable brilliance with regards to his approach in building strategic partnerships. In 2006, Brazil started to form the economic bloc named BRIC (later BRICS), which consists of Russia, India, China and South Africa. In 2010, the country began to prioritize relations with countries of South America, helping to launch the creation of the Union of South American Nations (UNASUR), which integrated all 12 countries of the continent. As part of the UNASUR project, the political bloc cultivated intercontinental ties in the area of ​​security. This was demonstrated with the creation of the South American Defense Council, which provides joint military exercises, participation in United Nations peacekeeping operations, exchange of information regarding global defense scenarios and also the integration of military bases and infrastructure. These initiatives were admirable because they aimed to cultivates mutual trust among the countries in South America. These initiatives marked a departure from traditional Brazilian foreign policy, which previously revolved strategic interests of the United States. These foreign policies generated obvious discomfort and indignation among the Yankees. They perceived this new foreign policy framework as a symptom of rebellion in a region where historically held tremendous political influence. Unfortunately, following the coup of 2016, these foreign policy initiatives have been reverse and replaced with deeply unpatriotic policies. There is much speculation about the role of the Armed Forces in the current political climate. Some have advocated for possible direct action by the military? What is the position of the military with regards to the current state of affairs? What is your opinion regarding this matter? I served as an officer of the Air Force but I've been out of active duty since 1998. That said, I spent 35 years in the barracks. So, I am only basing my opinions on experiences and insights that I accumulated while I was on active duty. My opinions are also based on my reflections based on conversations with my colleagues who left or continue to serve with the Ministry of Defense. Finally, my thoughts on this subject also come from the subsides that I receive as a result of my participation in academic debates and study of texts related to the topic. So, with that said, first of all, it is important to recall some historical facts that occurred during the 40’s, 50’s and 60’s of the last century, when there were intense ideological clashes between members of the Brazilian military elite. One of these groups was composed of military personnel who defended, among other things, the unconditional alignment with the United States, including Brazil's participation in the Korean War, which was promoted by the U.S government. Among other anti-national positions, they rejected the creation of Petrobras and defended the appropriation of the country's national infrastructure to foreign corporations. This faction of the military were known as the “surrenders”. Following the military coup of 1964, the anti-nationalist faction of the Armed Forces rose to power. They quickly carried out a extensive purge within the ranks of the military, which specifically targeted a group of around 7000 officers that were identified as ideologically nationalistic. In addition to the purge, the newly established military junta made sure to reform the military academies in order to prevent any potential "political deviations". Unlike countries such as Argentina, Uruguay, Venezuela, and Ecuador, the progressive governments which lead Brazil in recent years, Brazil not devise or carryout a strategy to eliminate conservative ideologies, which serves as an impediment to identify the real enemies of the country. Therefore, it is not unreasonable to say that the political thinking of the Brazilian military, with occasional exceptions, is rooted in the ideology from the 1960s. However, I suspect that certain future political events may generate conflicts within the military leadership. It is not surprising that General Sérgio Etchegoyen favors the sale of state-owned enterprises to foreigners. This posture is consistent with his family’s political orientation, which has held historic ties with the Brazilian military dating back to the 1940s. These same sentiments were also echoed in a recent speech in Brasilia by general Hamilton Mourão. Similarly, General Edson Leal Pujol, Military Commander of the South, also delivered a speech, in which he joined the chorus of military officers expressing their political perspectives, which is forbidden under Brazilian military code. During his remarks, the general said that after the fall of former president Dilma, the Workers Party should have issued more self-criticisms during the their national congress in 2016. During his speech, he accused the PT of several mistakes during their time in power including the PT’s inability to impose limitations on the overwhelming influence of the Brazilian media. He also accused the PT of failing to modify the curriculum of the country’s military academies. General Pujol also cited the PT’s failure to establish alliances with officers whom were sympathetic with the positions of the party.